For the educational purpose , In this article we are using Windows Xp as a remote PC. Before experimenting with TELNET , make sure that telnet services is started on remote PC. Press Ctrl+r , your Run window will open . Type services.msc and press OK Button . Your Services window will open , now find the Telnet Service . Once you find it , right click then go to properties and click on it . Here is your Telnet Properties window will open . Now goto startup type and from dropdown select Automatic . Now click on the start button to start the Telnet Services . And at last click on Ok button . Using Zenmap for scanning the open ports . To connecting with telnet use the command . Here we are going to connect with a remote host on the network. After few seconds it display a banner Welcome to Microsoft Telnet Service and then it ask you to enter the login id and password of remote host . You should know the login and password then only you can use Telnet . And after input correct login and password , its connected with Telnet and windows shell is display on your Backtrack terminal . 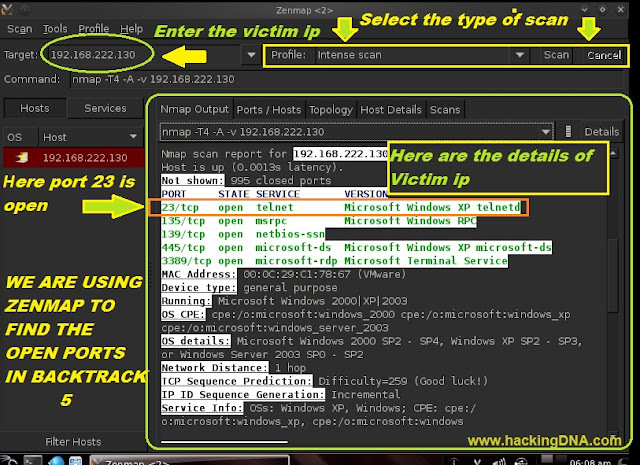 To view victim ip address , use the ifconfig command . Use ipconfig /all command . Creating a directory using md command on the remote PC . In this example , we connected to a unix OS (metasploitable) . This is how we can use Telnet Service on Backtrack 5. I hope you like to work with TELNET on Backtrack 5 . This is the small experiment done on Virtual Machine to show you how we can use Telnet Service on backtrack 5 . Good work with TELNET bro !!!!!!!!!!!!!! Best blog i have ever seen . Thanks hackingDNA for great tutorials . With approach could someone upload/execute and permanent backdoor to be used with metasploit? Like with the connect back shell? 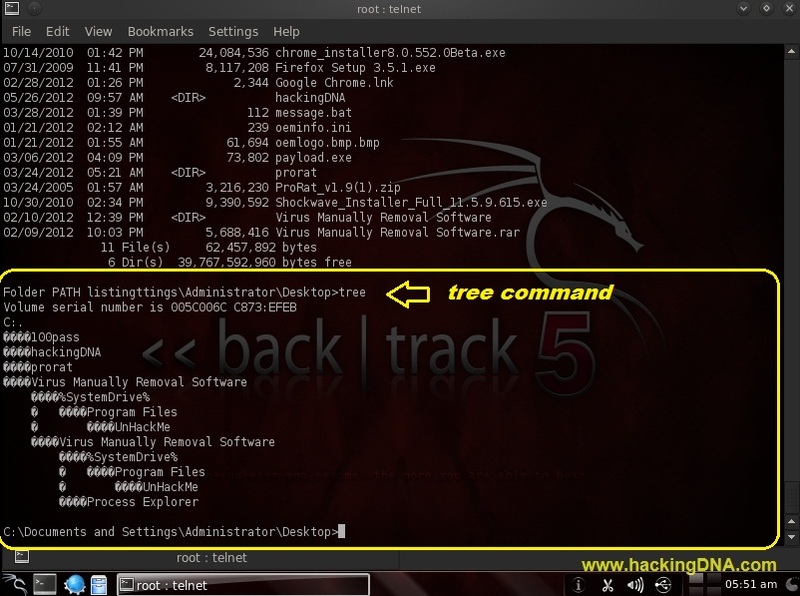 how i can hack a facebook acoount with back track 5!! !